PRODY ALSO ENJOYS GOING FOR LONG HACKS IN CONSERVATION AREAS. 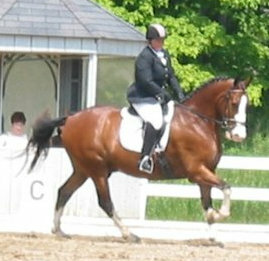 Cornerstone Spring Into Dressage- National Gold Show - Palgrave, Ontario - June, 2009 - Level 1 - 66% and 61% - Placed 3rd and 6th. 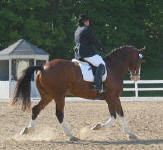 Purchased in February 2005, Prody was the first Draft Cross to join Prospect Equine Farms. He is a full brother to Prospect's Atheana and a cousin to Prospect's Ebony. Prody was trained to drive and was part of a championship driving team until the fall of 2004 when he outgrew his teammates. 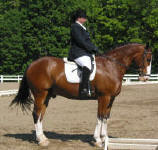 He then began his career under saddle. 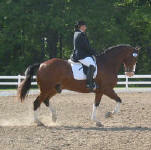 In 2005 and 2006 Prody competed in schooling dressage and entry/pre-training level horse trails. 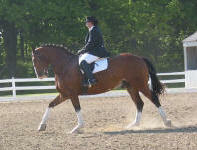 Through the 2006/2007 winter dressage began to take a greater focus in training with Prody and Maureen – they seemed to really enjoy and excel in the training. An unfortunate accident at the beginning of the 2007 season at their first event, where Maureen broke her leg, was the beginning of the end for eventing for this pair. 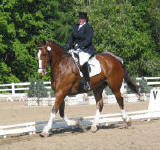 However it also became the beginning of more dedicated dressage training once back in the saddle. 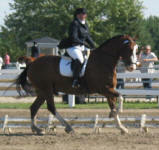 In 2008 Maureen and Prody competed in several National “Gold” Dressage Shows with the assistance of FEI Dressage Rider Stephanie Jensen’s guidance, culminating in a 5th at Cornerstone and the CNE Classic in Level 1. This team is now working on Level 2 and beyond.